Someone once said that if you build a better mousetrap, the world will beat a path to your door. The same thing can be said for weedless spoons. There have been a lot of attempts at making the ultimate weedless spoon. Many have come close, but never quite succeeded until now. A Minnesota company just may have come up with the ultimate weedless spoon. I first discovered the spoon at the Minneapolis Sportsman Show. Wandering the rows of vendors selling all sorts of fishing goodies, I stopped at a booth where the Weedless Bait Company was displaying their spoons called the Fishtrap. They had a most unusual design. The treble hook was attached to a slide that moves along a cut-out track in the middle of the spoon. Two treble hooks slid into the back of the spoon, while the third hook hooks to a weedguard. With all three hooks protected, the spoon can be dragged through any weeds without the treble hook catching on anything. It also can be dragged over logs, brush, rocks and other obstacles without hanging up. As the man at the booth explained it to me, when the fish hits, it pops the weedguard, allowing all three treble hooks to slide back about an inch, exposing all three hooks to set the hook with. Admittedly, I had some concerns that something that mechanical would not work the way it was supposed to. However, I was intrigued enough that I bought three of them. They floated around my tackle box for about a year until one evening in Canada. We had taken enough walleye for dinner and had decided to fish a large, weedy bay for northern until it got dark. My brother-in-law, Tim Wegener of Random Lake, Wisconsin, and I floated the shallow water pitching our lures toward the weeds. He was in the front of the boat and was fishing a large spinnerbait, and I was in the rear of the boat using a yellow with red spotted Fishtrap. I was amazed. The Fishtrap was doing everything it was supposed to do. I was throwing it into heavy weeds, and it came through without hanging up. I dragged it through brush and over logs without a problem. I flipped it into a brushy area, and as I was bringing it back, I saw a northern rise in the water behind it. Its back looked as wide as my hand, and as it cruised behind the Fishtrap with its back out of the water, it reminded me of movies of alligators. I popped the rod tip a couple of times, and the fish surged forward, engulfing the spoon. Rearing back, I set the hook. The fish was on solidly. I horsed the fish out of the brush into the open water, and the fish tore off with the drag screaming. It stopped and I briefly got the fish turned around and coming back toward the boat when it took off again. Five minutes later the fish was thrashing next to the boat as Tim slipped the net under it and hauled it into the boat. The northern was about 10 pounds. As I pried its mouth open to remove the hooks, I noticed that it was solidly hooked with all three hooks. Everything on the Fishtrap worked as advertised. I caught several more northern that evening and a two-pound walleye as well. I was hooked. It did everything it was supposed to do and caught fish. With two hooks buried in the back of the spoon and the third on a weedguard, it can be dragged over and through a lot of brush and weeds without hanging up. Although the fishtrap seems like a new design in weedless spoons, it really isn't. The first Fishtrap weedless spoon was originally made in 1944 and was first marketed in 1947. It went through a number of owners to include Heddon Baits, until Ken Schirmers purchased the company in 1980. He had worked with the baits for three years prior to purchasing the company, so he has 20 years' experience with the Fishtrap. The Fishtrap is a USA-made product, with the exception of the hooks. The hooks are imported from Norway. 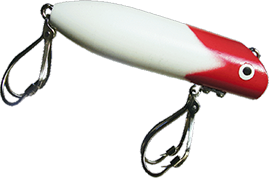 The spoon comes in three sizes: the Junior at three inches and 5/8-ounce, the Senior at 3 5/8-inches and one ounce, and the Musky at 5 1/2-inches and 2 1/8-ounce. They sell for $6.50 for Junior, $7.00 for the Senior, and $9.00 for the Musky. It comes in 23 different colors ranging from me silver and gold and the traditional red and white to fluorescent colors such as pink and white.